Hello Friends and welcome to this month's vintage alphabet party brought to you by the letters P~Q~R. 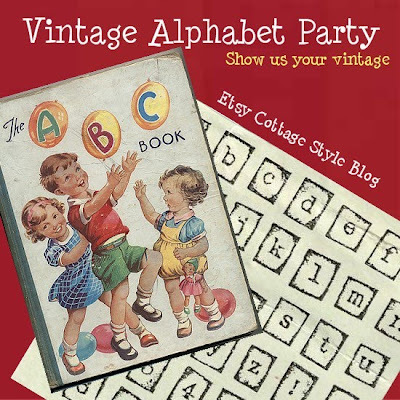 The idea here is to showcase and feature vintage items starting with these letters. So let's start the party with the letter P. Many years ago my grandmother made gorgeous PILLOWS using a pleating technique. I love to bring this one out during the Fall and Winter months because of it's rich red burgundy color. These took hours of work and had to be clearly marked on the wrong side before creating. I remember as a child, my mother marking the fabric for my grandmother, who then would sew the creation into the wonderful pleated design you see on this square PILLOW. PITCHERS from my Vintage Collection! Vintage PRINTS, I just adore framed in shabby ivory! Vintage PITCHER & bowl, handmade by my Mother many years ago! Gorgeous PLATTER, another treasure of my grandmother! Collectible glass PUMPKIN candle holder originally from Avon! Cherished PIE PLATE! from the Watson Company. Moving on to the Q's was more of a challenge but I did think of a few treasures starting with this very old QUILT given to me from my grandma. It has gorgeous warm Fall colors and a cozy quilt to wrap in on a cool Autumn day to relax. QUILT Friendship Heart made for me by a dear friend, many years ago! And, you just have to love the old QUART size Mason/Ball Jars! Lastly for the Q's I have a vintage QUILTED FAN PILLOW also could be one of the P's. So this brings us to the R's and to start I have to share with you one of my very favorite pieces, treasured and loved. Created by my great grandfather in the early 1900's from the Glass Factory in W. Virginia. It is a gorgeous RED GLASS PLATTER (also could fall under the P's) with a swirl design, very art deco in style, and I display this gorgeous piece in my red quest room. Vintage RING BOXES~ the one in the middle was my grandmother's and I recently saw it in an antique mall marked 200 dollars! Vintage RED BIRDS from the 40's. My Dad loved these and made shadow boxes to display them. I have them hung right on the wall. Vintage ROSARY BEADS from the 50's these belonged to my grandmother! These beads actually glow in the dark. They are beautiful in person. More ROSARY BEADS! The black beads are so dear and belonged to my hubby when he was in grade school in the 60's. The white beads are from Italy from a great Aunt. Vintage RED SHORT HAND BUSINESS SCHOOL BOOK! This wonderful book was my sweet Mother's from the middle 40's when she was in high school. Look you can even see some spilled ink on the cover. It had other owners before her, but she was the last. Here is a peek inside. See the short hand? WOW!! Lastly to finish the letter R, I have one of my most cherished treasure from my Mother. It was her RECIPE BOX, stuffed full of recipes just as she left them. I have gone through it completely but it will always stay stuffed full just like it is. Some of the best in the world recipes are tightly stuffed in this box. Some date to the early 40's before she even married. I love it and this wonderful treasure always reminds me of childhood dinners and wonderful times in the kitchen with my dear Mom! A look inside this special RECIPE BOX! Now for my last R is another wonderful treasure. MOM's RECIPE BOOK from the 40's. It was first published in 1929. This book is so lovingly used and worn, that mom had to add a book cover years ago made from a grocery bag. In the middle of the book is a section on how to cook during WARTIME. These pages are with a blue background, hard to see in this picture. Inside pic of a homemade loaf of bread. Can you just catch the warm scent filling the air on a Fall day? So yummy! Once again here is the grocery bag cover keeping company with my dear pie birds. So that's it for the letters P,Q and R. I know this was a long post and I thank you for staying around to the end. It was a fun challenge this month and if you'd like to visit many more participants, click ETSY COTTAGE STYLE and view the other wonderful vintage finds. Remember to enter my Visitor Thank You Giveaway and drawing to be pulled from the pink cowgirl hat on October 1st. As always, it was wonderful to have you visit and I enjoy each and every comment left. Till I see you again, you know where I will be. In the studio creating lots of new treasures to fill the shelves HERE.